You can now check out video photo montages set to Stefani's music. 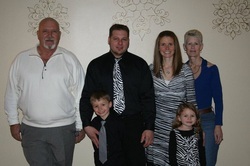 The videos feature Stefani, her family, and others battling chronic, life-altering diseases. You can check them out by going to the Music tab and scrolling down to Video. Saturday brought a very successful Album Release Party for Stefani. Nearly 60 people attended the event and over $200 was raised for her chosen charities, UMDF and IDF. And this amount does not include the portion Stefani donates from the sales of each CD. If you have not yet purchased your copy, you can do so here or on iTunes! A portion of each CD sold through March 2012 was donated to two different charitable foundations. These charities benefit research, patient support, and education for people battling the same illnesses that Stefani and her children battle. It's true! For each CD sold, Stefani has donated a portion to both the United Mitochondrial Disease Foundation (UMDF) and the Immune Disease Foundation (IDF). 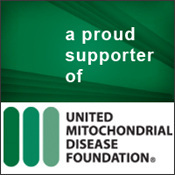 The UMDF aims to "promote research and education for the diagnosis, treatment and cure of mitochondrial disorders and to provide support to affected individuals and families." Similarly, the IDF is "dedicated to improving the diagnosis, treatment and quality of life of persons with primary immunodeficiency diseases through advocacy, education, and research." So thank you for each purchase because you are improving the lives of the people who battle with these life-threatening illnesses daily! Stefani Bush will be hosting a release party for her debut CD, Hope Rising: The Journey, on Saturday, November 20th from 7-9pm. The party will be held at Nabnasset Lake Country Club in Westford, MA. Join us for the party with live music. 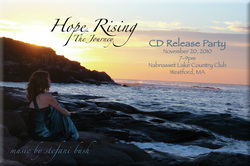 The Release Party for Stefani Bush's debut CD, Hope Rising: The Journey, will be on November 20th from 7-9pm. Location is TBD. Check back for more details! Please join the mailing list to get the low down on concerts, deals, Hope Rising, Stefani Bush, and everything related. You can click to your right or at the bottom of the page to sign up! 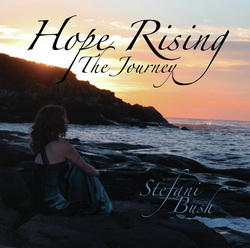 Welcome to the new site for Stefani Bush's upcoming CD Hope Rising: The Journey. Please pardon our dust while we make this site spectacular.